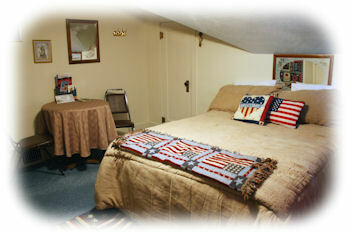 The Kristi Room is upstairs in the small house with a queen bed, flat-screen TV and spa tub. Please note that the stairs to this room are narrow and steep. Each of our thirteen rooms is unique and all have their own private bath along with color television, phone, and daily maid service. Nine of the rooms feature double spa tubs, which are a great place to sit back, relax and unwind after your day of fun in the sun. The common areas are open to all and free WiFi is available in each room. Let us know what you're looking for in your accommodations as we can suit a variety of budgets and family sizes. Flat screen TVs, wet bars, private entrances, fireplaces, extra beds and pet friendly rooms are all available.